The View Ladies Hawk Video Game for Kids Health? I say No Way! 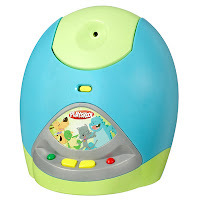 Today on The View, after a rousing discussion about healthy kids, a free giveaway for VTECH'S VMOTION, Video Game machine was presented to the audience members. Hmmm...Video Games to get your kids moving. Video games are entered into a 'health kids' discussion? I smell someone simply trying to sell me something. Let me weigh in on the frustrating new trend of video games that aide in fitness for kids. With cell phones, computers, online EVERYTHING, do we really want our kids to be getting their exercise habits from another SCREEN? (And its a long shot that they exercise is even adequate...) I think there is no better way for a child to get exercise than traditional methods: basketball, football, running and skipping through the park, swing sets, playing ball and even throwing a tennis ball against your wall....until your parents go nuts and ask you to stop. When kids get into high school they aren't going to join the 'video game team' are they? No. Lets keep real sports and physical games in the forefront of our kids. Not another video game that glues their eyes to the screen and keeps them indoor--right a few feet away from the kitchen cabinet. I think anyone trying to claim that these video games are great for promoting a healthy lifestyle is really just trying to sell something....a video game toy. Go to target and buy a soccer or basketball....save your money and your kids health! Do you agree with me on this subject?? ?